Posted April 23, 2017 by Tobias Forrest & filed under Episodes. 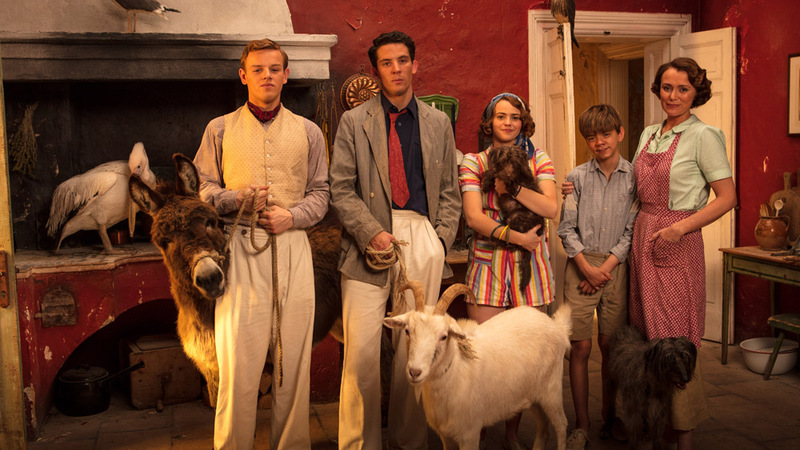 Louisa’s emotional declaration characterises an opening episode which reintroduces us to the Durrells, Corfu and the charming world we loved from Season 1. Reunited with the family we find them struggling to make ends meet – a situation exacerbated by the arrival of their formidable new landlady, Vasilia who takes away their furniture as collateral for not paying her rent. Determined to keep their house, Louisa comes up with a plan to sell real English produce at Corfu’s market. Buoyed by this idea the family get to working milking goats, farming and beekeeping, and Louisa announces her secret weapon – scotch eggs. After an unsteady start, and with Spiros’ assistance, the produce begins to sell. But the jubilation is cut short when Spiros informs Louisa her food has ‘poisoned Corfu’ and her scotch eggs are assumed to be the culprit. Spiros lends Louisa the money to pay off Vasilia and keep her off their backs for the time being. Elsewhere, Gerry devises an otter breeding program with Theo, Leslie gets into trouble when he accidentally shoots Roger, Margot decides to become a Greek nun after learning that her monk friend, Pavlos, has taken a vow of celibacy and Larry faces a severe case of writer’s block until he realises his inspiration is right in front of him: the family. It’s a strong start to the second season which pulls us into the world effortlessly making it seem as if we haven’t been away. This first episode introduces us to Hugh, a potential new love interest for Louisa and it seems likely their blossoming relationship will dominate much of the series, and with a new ‘villain’ in the guise of Vasilia, the Durrells’ lives are certain not to get any easier. After Louisa’s ultimately disastrous romance with Sven in Season 1, the struggling mother of four unwieldy children deserves a little bit of happiness for herself. However, Hugh’s prior relationship with Vasilia will likely cause further problems along the way. Though there are few niggles with this opening episode it does play things a little safe and you aren’t likely to be challenged here. But the joy of Simon Nye’s terrific script allows the characteristic humour to highlight a fun and engaging drama perfect for its Sunday evening slot buoyed by its consistently excellent main cast. Keeley Hawes has established herself as a chameleon of television drama able to adapt to any role and make it completely her own with an ease of presence on screen. The Durrells continues to be that rare thing – a colourful, light-hearted drama that stands out amongst a sea of progressively grimmer programmes. The success of the first season showed there was still an audience for this simple, fun and bright family drama and Season 2 sets out to capitalise on that goodwill. Aired at 8pm on Sunday 23 April 2017 on ITV. Follow Tobias Forrest on Twitter here. Read more from Tobias on his blog here.